When I made my Dragon Award nominations last week I promised a forthcoming book review for A Place Outside the Wild by Daniel Humphreys. Here that review is. As I’ve noted recently, I have not had the chance to read much fiction this year. I’m trying to catch up on that, and I’ve finally made some progress. I have several reviews forthcoming over the next couple of weeks, so keep an eye out. Full disclosure: Dan and I “attended” the same online writing class from Larry Correia, and we’ve participated in the same closed Facebook group that resulted from that class. He’s also provided an excellent blurb for my upcoming novel, Post Traumatic Stress. With that said, these are my honest opinions on the book. Let me also say this at the outset: this is a zombie book, and I’m not a particularly huge zombie fan. I like them OK. Sometimes. I’m definitely not big into the zombie craze that seems to have hit over the last decade or so. I love Shaun of the Dead. I kinda sorta enjoyed the “28 Days” movies. I’ve watched exactly one episode of The Walking Dead. It didn’t do anything for me. I don’t particularly have anything against zombies. I just generally find them boring. Also, I strongly dislike “science” zombies. I could write an entire post about this topic, but it largely boils down to the fact that most zombie writers aren’t scientists and they get it all wrong. This book is about science zombies. With all of that said, I didn’t like this book. I loved it. Dan had a steep hill to climb. He charged up it like a platoon of Marines, killed the defenders at the top, planted his flag, and did a little dance. I recommended this book for the Dragon Award in horror, and for good reason. Dan has a humorous writing style that caught me from the beginning. The actual story, however, took just a little bit to warm up. But once it did, I didn’t want to put the book down. I really enjoyed all of the characters, and reading about their struggles trying to cope with the new world around them. In particular, I enjoyed Pete the amputee sniper and Larry, the protagonist’s father-in-law. And I enjoyed the way he wrote the children, which are difficult to get correct as a writer. Another nice thing for a zombie book: this isn’t actually an action story. There is action in it, and it’s great. But it’s actually more of a drama – a really good drama. I may, however, have sweated just a tad from my eyeballs when the Marines showed up to save the day playing Guns N’ Roses. But we’ll never speak of that again. Last, but not least, Dan provides an explanation for the science zombies that I can actually get behind. As I noted before, most zombie writers aren’t scientists. Well, Dan isn’t, either… but he’s an IT guy. And I’ll just say that that does give him the right background to understand what he’s talking about here – at least enough to get me over the suspension of disbelief. Well done, Mr. Humphreys. 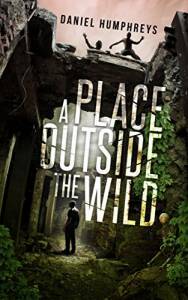 A Place Outside the Wild is a first novel, and it does show a bit of roughness from that. But the strengths of the story easily outweigh that. It’s an easy five out of five stars, and I’m very much looking forward to reading both the forthcoming sequel and his current new release, Fade. If you like Zombies, check this one out. Hell, even if you don’t like zombies, check this one out. It’s that good. Post Traumatic Stress will be available on August 1. You can pre-order your copy now from Silver Empire.